When looking to install a new gas range in your home, you need to be mindful of the gas lines available. Trying to connect the range to the first pipe you can find is a recipe for disaster. Without the right sized gas line, your appliance won't work properly and could turn into a serious safety hazard. To figure out the appropriate size of gas line, you'll need to know the amount of gas your appliance uses, as well as the total length and diameter of the pipe in your home. With this information, you can use a gas piping size table to determine the right fit for you. To figure out how much gas your appliance uses, you can always check the surface of the stove for the British Thermal Unit (BTU) input rate. This number is the appliance's energy rating and measures the amount of heat your range can give off. For every BTU, the range can increase the temperature of a pound of water by one degree. Each burner will have its own BTU rating, as certain burners may be specialized for simmering or searing. For example, the average gas range requires roughly 7,000 BTU per burner, but some models may have burners with rates as low as 5,000 and as high as 10,000 BTU. The BTU input rate is directly proportional to the range's gas requirements. The amount of gas used by your gas range is measured in cubic feet per hour (cfh). To convert the BTU input rate into cfh, simply divide the BTUs by 1,000. For example, if your gas stove uses 65,000 BTUs, the cfh usage would be 65 cfh. You can use this information alongside a gas piping table to determine the diameter of gas pipe you'll need for safe and efficient operation of your appliance, but you'll also need to know the length of your pipe. Pipe length is important because it helps to factor in the amount of pressure drop along the line. To determine this, find the length of pipe needed to connect the gas meter with the farthest gas appliance in your home. With all of this information on hand, you can use a gas piping size table (available in the resources section) to determine the line you'll need for your range. When using the table in the resources, look at the top of the table to find the length of gas piping. Look down that column until you locate the cfh usage for your range. The number on the far left will be the diameter of pipe needed for your gas line. Note that if the exact numbers in your home aren't listed, you can and should round up to the next number on the table. Doing so will prevent problems resulting from piping that's too large or has too great a pressure decrease. 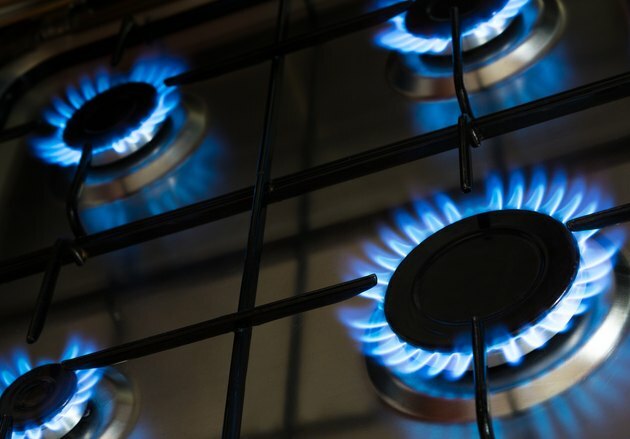 These sizing rules apply regardless of the type of gas your new appliance uses, but keep in mind that propane ranges have a higher BTU input requirement than natural gas ranges.